Many of us dream of having a straighter and more beautiful smile, yet we don’t want to wear braces for years. Thankfully, this is where our highly advanced SureSmile Digital Orthodontic Treatment comes in handy. Utilizing state-of-the-art orthodontic imaging technology, treatment planning software and custom bent orthodontic wires, the advanced SureSmile system is designed to provide patients with the fastest, most accurate teeth alignment treatment possible and has been proven to reduce overall treatment times by as much as 34%. Before your SureSmile journey begins at Harmony Orthodontics, our orthodontist will refer you to get a CT scan of your face, including your teeth and jaw. This allows us to gain a comprehensive overview of your oral health and structure, enabling us to see as far as the roots of your teeth. These scans are then digitised and SureSmile is used to create a 3D model of your teeth. From this, we are able to devise your personalised treatment plan, as well as to work out how to accurately reposition your teeth for the most successful results. What’s the Difference Between SureSmile and Traditional Braces? While SureSmile largely looks like traditional metal or Incognito braces (depending on their placement at the front or back of the teeth), they contain one major difference. With conventional braces treatment, our experienced orthodontist, Dr Maznah Manaf will manually bend your archwires using special pliers. With SureSmile, however, we entrust this task to our reliable technology, using a robotic system which pinpoints accuracy to within one tenth of a millimetre. The bends in the archwires are first planned digitally, before being programmed into the robotic system. It’s orthodontic technology at its most advanced! Precise tooth movement: With the help of our orthodontist and the SureSmile technology’s precision, you can receive more accurate results than ever before. This creates even higher success rates, including increased longevity and functionality. 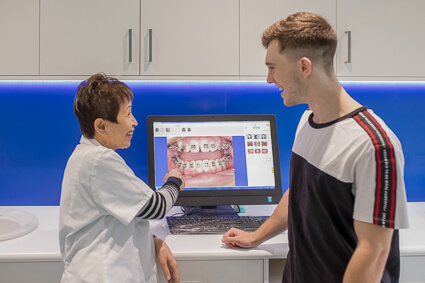 You can view your predicted outcome digitally: With traditional braces, it can be easy to wonder how your smile will look once treatment is complete. SureSmile, on the other hand, is all done digitally, allowing you to see a mock-up of your new smile before you’ve even started treatment. Shorter treatment time: Along with higher accuracy, comes shorter treatment time. While traditional braces can take up to a few years to achieve desired results, the SureSmile system allows patients to complete treatment in just 8 months on average. Less discolouration and calcification after treatment: Because the brackets are fixed to your teeth for a significantly shorter timeframe, this results in less discolouration and calcification on your teeth. Are you thinking about pursuing SureSmile Digital Orthodontic Treatment? Please contact Harmony Orthodontics today to discuss this treatment further with Dr Manaf!